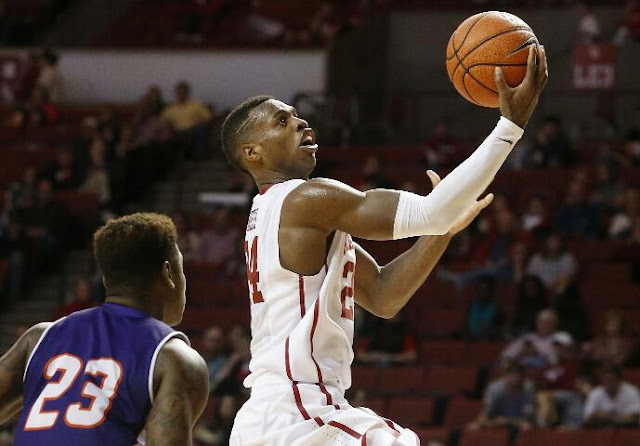 The Los Angeles Athletic Club announced Monday that OU senior guard Buddy Hield was one of 10 players named to the 2016 John R. Wooden Award All-American Team, selected by hundreds of national college basketball media members and the award’s former winners. Additionally, Hield was one of five players invited to Los Angeles for the 40th annual presentation of the John R. Wooden Award to the men’s most outstanding basketball player. The 40th annual presentation of the John R. Wooden Award will be the anchor presentation of the ESPN College Basketball Awards Show presented on ESPN2 on Friday, April 8 at 7 p.m. CT.
On the season, the Freeport, Bahamas, native is averaging 25.4 points (ranks second nationally), 5.7 rebounds (ranks first among Big 12 guards), 2.0 assists and 1.1 steals in 35.4 minutes per game. He's shooting .504 from the field, .465 (146-314) from 3-point range (ranks fourth in nation) and .880 (176-200) from the free throw line. His 4.1 treys per game pace the country. Created in 1976, the John R. Wooden Award program features the most prestigious individual honors in college basketball. The Wooden Award Trophy is bestowed annually upon the nation’s best male and female player who have been certified by their universities as meeting the criteria of the award. Previous winners include such notables as Larry Bird (‘79), Michael Jordan (‘84), Tim Duncan (‘97), Candace Parker (‘07 and ‘08), Kevin Durant (‘07), Maya Moore (‘09 and ‘11), Trey Burke (‘13) and Doug McDermott (‘14). Wisconsin’s Frank Kaminsky won the 2015 Wooden Award presented by Wendy’s and Breanna Stewart of Connecticut won the 2015 Wooden Award. Since its inception, the John R. Wooden Award has contributed close to a million dollars to the general scholarship fund of the honoree’s University in the name of the All-American recipient. The Award has also enabled more than 1,000 underprivileged children to week-long basketball camps in the Award’s name. Additionally, the John R. Wooden Award partners with the Special Olympics Southern California each year to host the Wooden Award Special Olympics Southern California Basketball Tournament. The day-long tournament takes place at the Los Angeles Athletic Club the weekend of the John R. Wooden Award presentation, and brings together Special Olympics athletes and the Wooden Award All-Americans.